PSC was formed in 1994 by six artists to promote pastel artists, the soft pastel medium and to encourage the appreciation and art of pastel painting. PSC has become a far reaching organization, uniting artists across the Rocky Mountains and beyond. An Electronic Newsletter for pastel artists is included with PSC membership. Pastel workshops, classes, exhibitions and pastel related editorial articles can be found in the newsletter. PSC members are from all around the US and we even have an international member! The Pastel Society of Colorado is incorporated as a non-profit organization. The PSC is run completely by volunteer Members. Please visit our Pastel Society of Colorado Shows website at www.PSCShows.com. There you will find show award winners, show dates & times, locations, and other important information for visitors who would like to attend our shows and receptions. Our Annual Online Shows are also displayed on this site! WHAT IS PASTEL? Pastel is pure pigment. A particle of pastel pigment seen under a microscope looks like a diamond with many facets. Pastel is the most stable and permanent of all painting media. Pastel (often confused with chalk, which is limestone and dye) is actually dry powdered pure pigment mixed with a liquid binding solution to form a paste. 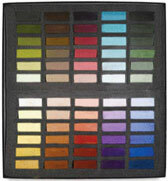 The word pastel is derived from the French word "pastiche". Historically, pastel can be traced back to the fifteenth century. Leonardo da Vinci introduced pastel using "the dry colors method" as a highlighting technique for drawings. Pastel emerged as a major force in eighteenth century portraiture. Rosalba Carriera was among the first to work exclusively in pastel. With the advent of impressionism, new techniques appeared and subjects included landscapes and nudes. Edgar Degas, Mary Cassatt, William Merritt Chase, Childe Hassam, Georgia O'Keeffe, Frank Reaugh and James McNeil Whistler feature pastels among their most important works.